I found yoga about four years ago when I decided to download an app on my phone. The app was poorly designed and it made me reluctant to practice. However, after following some yogis on Instagram, my interest peak as I wanted to be able to get into those incredible postures. Over time I developed my own practice, largely influenced by these yogis on Instagram, and I eventually started to make up my own flows. They included everything from backbends to arm balances, inversions to hip openers. 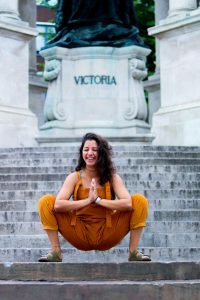 I discovered Ashtanga Yoga about two years ago, but I din’t realise how structured it was until I went to do my 200 hour YTTC earlier this year, in Goa, India. I did my teacher training in Ashtanga and Ashtanga Vinyasa. I absolutely fell in love with the discipline of the practice and how it allows for growth over time. The internal meditative sense that occurs with the breathe, body and mind is incredibly powerful and something I would love students to experience for themselves. In contrast to the rigidity to the Ashtanga primary series, the fluidity of Ashtanga Vinyasa does make a welcome change to my practice. I’m able to move in tune with my body, by doing asanas that feel right for me in the present. It can be as challenging or as restorative as I like, and this dynamic element of this practice is what makes it so enjoyable. As I continue down this path as a yoga teacher, my knowledge, learning and understanding will forever continue. I do put a great emphasis on my students being content with their own personal practice, and not comparing themselves to others. Ultimately, I want my students to walk away from my class with happiness and joy radiating from them. My Ashtanga classes are best suited to those who have been to yoga classes before.